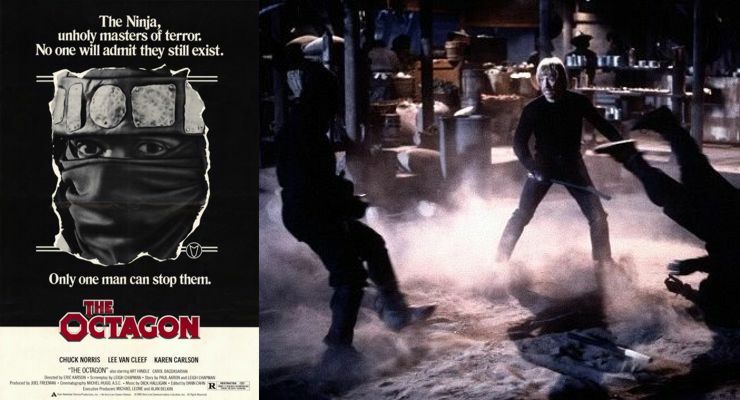 The Octagon (1980) is an action film that stars Chuck Norris, Karen Carlson and Lee Van Cleef and Tadashi Yamashita. It was directed by Eric Karson and written by Paul Aaron and Leigh Chapman. The Octagon (1980) was filmed in Los Angeles, California and released on August 14, 1980. This film was martial artist and actor Richard Norton’s film debut. The Octagon (1980) used voice over effects to portray the inner life of Chuck Norris’s character, Scott James. In The Octagon (1980) A martial artist must defeat a plan by ninjas to create a worldwide training camp for terrorists.